Life Cover helps protect their futures, too. We all wish a bright future for our loved ones. Hopefully we'll continue to be a big part of their story, but when a life is suddenly cut short, those left behind can often be left with an altogether darker prospect ahead. The Life Cover can help light the way forward and that starts straight away. The policy pays up to £50,000 if you die during the policy term, which can be used to cover immediate expenses, such as funeral costs. The policy covers death from any cause after the first 2 years, you will be covered immediately for accidental death subject to the exclusions. With so much else to deal with at this difficult time, sorting the short-term finances for your partner or children is just the first step towards getting their lives back on track. But it's not the only way this Life Cover can help them. It can also be a longer-term solution for any family who would struggle to pay bills, meet mortgage repayments, bring up the kids and keep meals on the table without your regular income. It's about helping to keep things ticking over. It's about helping to take care of them, even when you're not around. It's about telling them you still love them. • Reckless consumption of alcohol (Consumption of alcohol such that it results in mental or physical impairment which causes the accident or results in you doing something you would not normally do without the influence of alcohol). If you die within the first 2 years of natural causes or from an accident where no claim is payable, all premiums you have paid will be refunded. This policy is underwritten by Scottish Friendly Assurance Society Limited. For a full explanation of the terms and conditions please read the policy documents carefully in the policy docs tab. Because while our feelings for the people we share a home with are enduring, life itself is inherently uncertain. The policy steps in to shoulder some of your family's financial obligations when you no longer can. How? By giving them a cash lump sum - up to £50,000 - to make up some of the shortfall when they no longer have your salary. It can help cover both the regular household outgoings, as well as any other costs that are harder to foresee. And, of course, funeral arrangements too. We all know that the rising cost of funerals is an issue for many members. 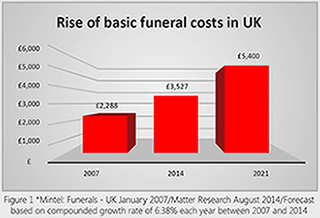 The graph shows how much an average funeral is likely to cost by 2021*. This Life Cover is designed to meet the needs of people who want to enjoy peace of mind knowing their nearest and dearest are going to be ok financially when they're gone. It's for people who want to help their family and home hold together when everything else can feel like it's falling apart. It's for people who have been looking after their loved ones for years, and now want a way to help secure their future too. "My family are extremely important to me, particularly Paul my husband…I felt that I had a responsibility to put something in place for him should that day come"
"I have 2 boys and just worry about leaving them without anything and paying for my own funeral"
"It’s something I’ve been meaning to buy anyway, but I just haven’t had a chance"
"Just in case something happens to me, I’m getting older, I’m not getting younger"
My life cover for just [[dispPremiumAmt]] monthly! UK residents aged 18 to 64 at the Policy start date can get covered – with no medical questions to answer. Acceptance is guaranteed and your Policy can continue until the first premium due date following your 69th birthday. Is there a waiting period before a claim can be made on the cover? You are covered immediately for accidental death which did not arise from any of the Policy Exclusions but for the first 2 years following your Policy Start Date you cannot claim for a death from natural causes. If you should die of natural causes in the first 2 years, then a full refund of premiums will be provided but no lump sum benefit will be paid. After this period you will be covered for death from any cause, provided you have paid all your Monthly Premiums when due. Am I covered for accidental death immediately? If you die within 2 years of your policy start date and your death is “Early Accidental Death” then Scottish Friendly will pay your full cash lump sum, provided you have paid all your monthly premiums when due. Can more than one person be covered by a Policy? No. The Policy covers the Policyholder only. How much cover can I have? The Policy offers a choice of lump sums between £10,000 and £50,000, going up in multiples of £2,500. Once your Policy starts you cannot change your Cash Lump Sum but you can set up an additional Policy as long as the total combined value for all of them is not more than £50,000. Premiums depend on the amount of cover you choose and how old you are when the Policy starts. Use our Quick Quote to select how much cover you need and see how affordable it could be for you. Your premiums will remain fixed for as long as you keep the Policy. Can I change my cover after the policy has started? No your Policy cannot be changed. All the benefits and the Monthly Premiums are fixed for the Policy Term. You can set up an additional Policy as long as the total combined value for all of them is not more than £50,000. Cover will start immediately for accidental death. For the first 2 years you cannot claim for death from natural causes, after this period you will be covered for death from any cause provided you have paid all your Monthly Premiums when due. What is ‘Early Accidental Death’? Early Accidental Death means death as a direct result of a single, unexpected, unforeseen and unintentional incident that happens within 2 years of the Policy Start Date of this insurance and is not a symptom of a disease or illness and which did not arise from any of the Policy exclusions. NB: you will need to advise us if your circumstances change. What does ‘guaranteed acceptance’ mean? It means that as long as you meet the eligibility criteria: that you are a UK resident aged between 18 and 64 at the start date then you will be accepted for cover. To make a Claim under Your Policy, Your representatives should contact Scottish Friendly at the address/telephone number below. Scottish Friendly will then issue them with a Claim form and information pack. Alternatively, you can contact Scottish Friendly by telephone on 0333 323 5433. Calls cost no more than calls to numbers starting with 01 or 02 and if you are calling from a mobile phone, calls will count towards any inclusive minutes you have rather than being charged separately. Telephone lines open: Mon to Fri 8.30 a.m. to 5.30 p.m. For your protection calls may be monitored and recorded. Do I have to pay tax on my pay-out? The benefit is not taxed at source, however, depending on the value of your estate when you die, the Cash Lump Sum on death may be subject to Inheritance Tax which is set by the government. * Calls cost no more than calls to numbers starting with 01 or 02 and if you are calling from a mobile phone, calls will count towards any inclusive minutes you have rather than being charged separately. Lines are open Mon to Fri 9 am to 6 pm. For your protection calls may be monitored and recorded. This Life Cover is only available to UK residents aged 18-64. In the event of your death, how much cash would you need? If selecting joint cover your spouse or partner must also be a UK resident aged between 18 and 60 at the policy start date. If they are aged between 60 and 65 you must select the no-claim money back option. This Life Cover is only available to UK residents aged 18 to 60. If you are aged between 60 and 65 you must select the no-claim money back option. This Life Cover is only available to UK residents aged 18 to 64. The minimum monthly premium for the Life Plan is £10.00. Based on your age the lowest lump sum cover you qualify for is more than the amount you have selected. Please move the slider to the right to find out the minimum amount of cover you qualify for. The amount that the policy will payout in the event of your death. The monthly premium includes a policy administration fee of £2.86. The monthly premium includes a policy administration fee of £3.86. The weekly premium includes a policy administration fee of £3.86.